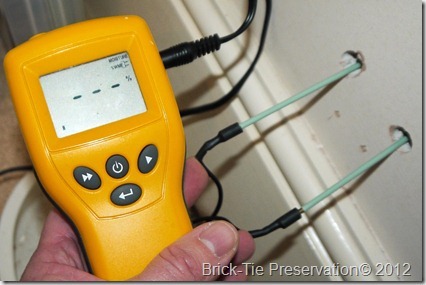 You are here: Home / Damp / Condensation / Damp-proofing and Damp diagnosis – electrical moisture meters are so useful. Electrical Moisture meters get stick from some. Lots of meter readings are used to justify remedial damp proofing which has been shown to be unnecessary. The humble damp meter has taken he blame, rather like knives are blamed for stabbings, in my view. I couldn’t do my job properly without my meter and here’s an nice example of how useful these meters can be. This bedroom window is in a damp ‘sump’ formed by the light well. The site is a converted 19th century mill near Bradford, West Yorkshire. Now turned into flash apartments over three floors. My client is the managing agent, driven to distraction by a complaint about damp in one of the flats. The manager is sure that the problem is condensation, but the lease owner will have none of that and things have turned serious, with talk of solicitors getting involved – the lease owner is convinced that the problem is one of damp, because the mill, like many of this age, was water powered and is built into a hillside. The worst effected room is partially below ground level – “The tanking has failed” he says. There are complaints of a ‘mouldy smell’ too. I’m on site to get to the truth. 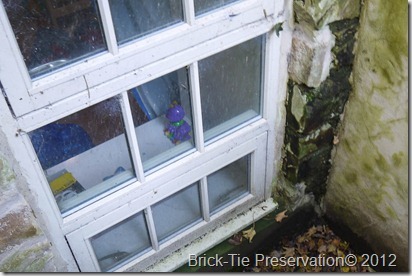 A walk around the building reveals poor drainage and moss on the wall to the rear, around the light well to the bedroom where the problem is worst – the pointing here is terrible and the rainwater discharge pipe does a great job of emptying water directly against the wall…. maybe the owner has a point? However, once inside it’s clear that the apartment is poorly ventilated, the heating is electrical convection units and the room in question, at the end of the corridor feels cold and unwanted…. ideal condensation scenario. The kitchen cooker hood simply recirculates with no ducting kit and the central extraction system, though on, is too weak even to hold a piece of toilet paper over the ducts in the bathrooms and en-suite, never mind the A5 card I use for testing. 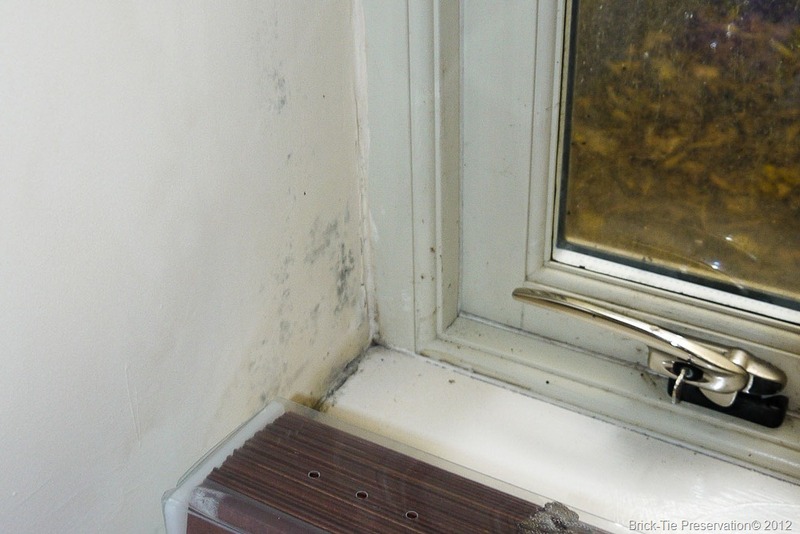 There’s mould growing in the bedroom below ground level, in the window reveals and whilst not heavy, there’s fairly widespread mould on the walls too. A quick walk around with my surface thermometer shows that the bedroom walls are four degris colder than walls in the rest of the apartment. The walls in the bedroom are a full 40 colder than those elsewhere. I don’t need a meter to tell me the house is a bit stuffy and humid, however, taking into account the fact that the effected room is below ground level and the external conditions would suggest a possible penetrating damp contribution I need to investigate further. There are no signs of surface disruption of the decorations, no salting, so I don’t think we have a break in the waterproofing. 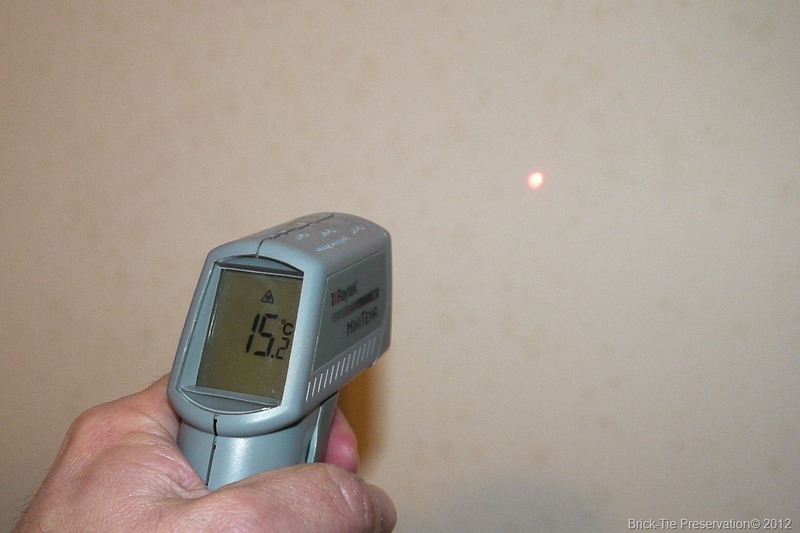 However, there’s a chance that we have interstitial condensation behind the dry linings, maybe the mouldy smell is derived from the rear of the linings, if there is a break in the waterproofing saturating the insulation, or condensation due to a lack of a vapour check. I use the moisture meter to take surface readings from the mouldy plasterboard and I find that though elevated, these are not particularly excessive. There’s no discernible moisture profile either. With the owner’s permission I drill a couple of small holes in the plaster board and I see that there is indeed a vapour check behind the plaster board, formed by the aluminium surface of the closed cell insulation. Drilling through this, I use insulated extension probes to measure any moisture in the insulation – there is none. Pushing harder I break through the insulation and press on the Cavity Drain Membrane behind it – the surface offers no reading either. This WME reading of 19.7% is not that high – despite the ‘at risk’ being indicated on the meter display. Here, insulated moisture probes allow measurement behind the insulation, (note my fingers pushing the probes hard to get a good contact at the ends) – there is so little moisture that the meter can’t even be coaxed into displaying it. Okay, so I knew that condensation was an issue – but damp issues often come with multiple causes and identifying one, may result in another being missed. Suppose I had recommended dealing with the ventilation issues and then some time later was summoned on site due to dry rot behind the linings, as a result of a break in the waterproofing? A break which I could have missed? 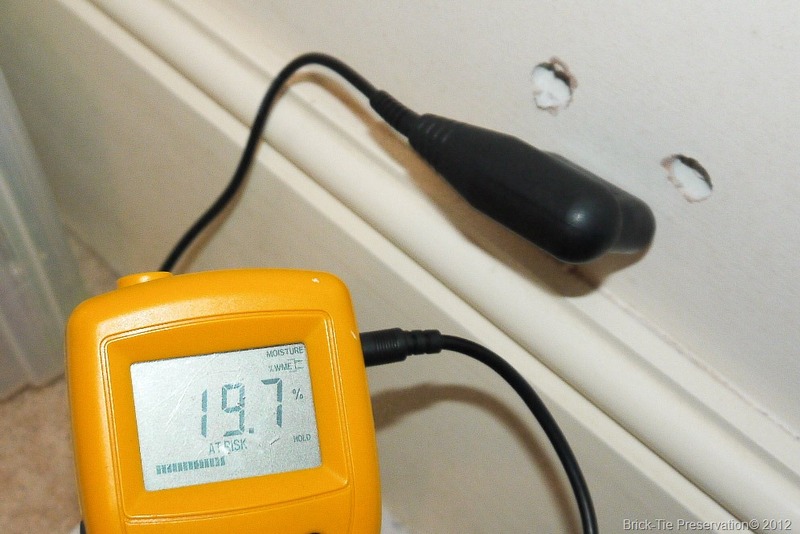 The moisture meter allowed me to rule out both penetrating damp, saturating and ‘chilling’ the insulation and condensation on the internal face of the membrane, which would have also saturated the insulation too. Great news for the owner of the apartment and the managing agents – no need for expensive works to the waterproofing – no disruption, just some additional ventilation and a tweak of the heating. Electrical moisture meters for damp diagnosis are very handy and with training and experience they are invaluable and can save money as easily as they can cost money – diagnosis is all in the skill of observation and interpretation. The insulated probes seen in the image can be used with most moisture meters, you don’t need an expensive MMS like the one shown. Just goes to show that the resitance meter in the hands of an objective and impartial damp surveyor is invaluable. I don’t understand your comment that the convection heating played a part in this. I could understand if it was a “Superser” gas heater adding moisture to the air, but I don’t understand why you feel that convection would add anything. Isn’t it just the same as a wet central heating system? In these cases the electrical convector heaters are a side issue but are involved in yh epverall environment. The problem is that they are very expensive to run. The result is that tenants tend to leave them off during the day and just turn them on for short periods when they need them. The result is generally lower average temperatures, which will tend to increasing RH%. They also tend to leave spare rooms unheated and these attract mould and such as water vapour from the rest of the house invades these spaces.Fuel poverty is driving this. Water filled gas central heating radiators tend to cost less to run and heat up and cool down slower. Also, individual thermostats on these tend to get used more, so that even ‘spare’ rooms are at least given a little background heat.